Tom Butler is a native Michigander, born and raised in Detroit and is a graduate from Sacred Heart Seminary. He has been one of the Michigan Floral Associations biggest supporters over the years and was on the top of the list when it came time to choose who would be the first inducted into the Michigan Floral Foundation Hall of Fame. 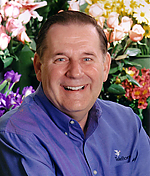 Mr. Butler is the Chairman of Teleflora, the world’s leading floral service provider to florists. He guides Teleflora in its mission to serve as a trusted business partner, friend and innovator to independent retail florists. With over 40 years experience in the floral industry, the last 24 with Teleflora and American Floral Services (AFS, which Teleflora acquired in 2000), Tom is widely considered the preeminent industry authority. He is known by florists in all corners of the country, and is considered by many to be the ‘Chief Champion of Florists’ — always there when they need him, always understanding their issues and concerns and always representing their cause. Prior to joining Teleflora, Tom was president and chief executive officer of AFS, a position he held for 15 years. Tom was instrumental in making the Teleflora/AFS merger the success that it has been, and has since added his industry knowledge and support to the Teleflora family. Tom’s distinguished career includes many industry roles. Among them: Member of American Academy of Floriculture (AAF); TI International World President; Incoming Chairman of American Floral Endowment Board of Trustees; Society of American Florists (Past Board Member); Member of AIFD, World Flower Council, Wholesale Florists and Florists Suppliers of America, Roses Inc., Columbia Flower Council, and state and regional floral associations. Among the accolades he has received: Recipient of the SAF Paul Ecke Jr. Award; Michigan Floral Association Award of National Industry Service; Florida State Florists’ Association Hall of Fame Award and Arkansas State Florists’ Association Distinguished Service Award. Tom is also a member of the Professional Floral Commentators International (PFCI). He is active in Grow For Life, Breast Cancer Research & Education Foundation (Board Member); Catholic Charities; OKC Chamber of Commerce (Business & Economic Trends Committee) and Oklahoma City National Memorial Foundation (Past Board Member).